By investing in and focusing on their Mill division, Nissen has been working to help their clients remain competitive. Buying ‘off-the-shelf’ from local inventories is the most expensive way to buy when compared to having goods shipped to your door directly from a factory; but buying direct cuts out the cost of local storage and handling. By leveraging their worldwide network of manufacturers and planning ahead, Nissen Fasteners is providing pallet and container quantities to its client network across the globe; as a result our are clients able to save a significant amount of money. 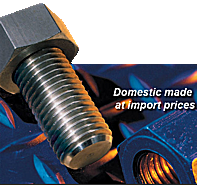 Of special interest are Nissen’s US manufacturers resources; what began as a manufacturing relationship for special domestic demands for Hex Head Cap Screws has expanded into an international distribution channel for high-quality US-made fasteners that are competitively priced against Asian products.